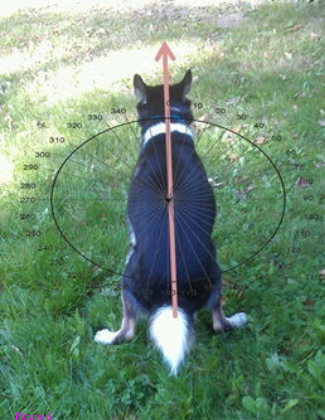 Do Dogs Poop In Alignment With The Earth’s Magnetic Field? The scientific life is not as glamorous as its propaganda would have you believe. It isn’t all jetting from luxury hotel to tropical island conference to plan the next round of grants (which include line-item funding for travels). No, sir. Some of it is hard work. Like following dogs around and watching them poop. As did Vlastimil Hart and a slew of others, publishing their results in “Frontiers in Zoology” (pdf). Hart figured that because birds do it and bees do it—even educated plebes do it—that dogs ought to do it, too. That is, make use of the earth’s magnetic field. Plebes learn to work a compass at the academy, and our canine pals surely “work the lines” when making deposits. What fun if it were true! You’d no longer need fear being lost in the woods miles from your GPS, batteries, or sextants. Just bring along Sparky and when the tree you just passed looks just like the one you passed ten minutes ago, you command “Make!” and voilà!, you’re out of the woods. As long as the magnetic field is calm. Conversely, you don’t need fancy expensive equipment to measure the hystericity (my own term for the level of anti-calmness) of the magnetic field. Just trot out Roofy and have him go. If he ends up facing east, or his end ends at west, then you know a storms a brewin’, electromagnetically speaking. Alas, the results do not appear true. The paper is very shoddily written. It contains few details of how the dogs were measured, like how they handled departures from perfectly straight backs (especially when peeing), or how they accounted for the error in measuring the dog pointed in this or that direction, and so on. They used hand-held compasses. The study was therefore not blinded. They were vague to the point of opacity about the difference in the magnetic field’s intensity, inclination, and declination, especially its local variations. They used the Kp-index to ascertain magnetic calmness, but this is a global and not local scale. There are numerous typos (which are no strangers to this blog, but rare in professional journals). Each dot is a dog? Then there were problems with the dogs. What in the world happened with “M07”, a 40-kilogram 4-year-old male Borzoi, who during the course of this most scientific study peed 2,478 times? Why, “M63”, a 25-kg 5-year-old Husky-Australian Shepherd mix, didn’t pee at all—though he pooped 46 times. The average looks to be (I did this by eye) around 50, um, efforts. All the authors said about this was that, sometimes, M07 was “analyzed separately”. And then the analysis itself is a hodgepodge. The picture with blue dots is part of their main story. Each dot is some kind of pooling across dogs pooping (by averaging?). This one was from the time period “20:01 – 8:00”, i.e. eight at night to eight in the morning. It was plotted once for all periods and once for “quiet [magnetic field]” periods. Now if all the dots were in line, it would show dogs have a preference for which direction they point when unloading. The dots are not in line, not here nor in any of their other plots. Further, there is no consistency in the dots for time periods or other breakdowns. There is enormous variation in pointing directions. So how did they come to their conclusion? How did they have the guts to write, “Our findings open new horizons in magnetoreception research”? Lots of statistics (on mean directions; this and that classical hypothesis tests). Which gave them wee p-values. What else? The study was picked up in the press, uncritically as all scientific studies which have nothing to do with politics are. 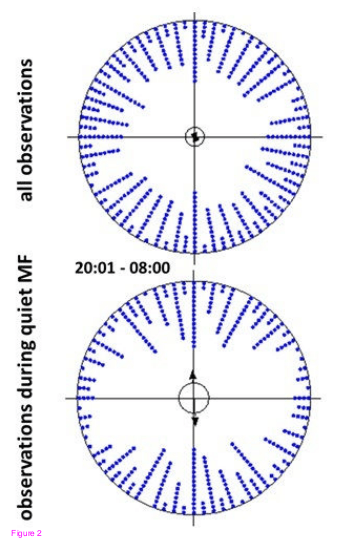 “The new findings have important implications in our understanding of magnetoreception in mammals.” Sure there are. Hey, if it was done by scientists using the scientific method, it must be right, right? The danger in these studies is that they plant anchoring biases, to lapse into the jargon. You might never have before thought of your dog pooping in alignment with the magnetic field, but after hearing scientists said they do and thinking on it for more than a moment, you will henceforth have the suspicion that Oscar knows which way is north. A harmless belief, surely. No, the real damage is the strengthening of the belief that science can do anything. Thanks to Rexx Shelton and Willie Soon for bringing this study to our attention. So then, most of it is pointless busy work waiting for the next grant? Look on the bright side: you have documented many studies which have ended up as excrement. Documenting one that started as such is a first. As a owner of mulitple dogs, I never observed any direction to their toileting. M07 was probably a non-neutered male dog. They have incredibly huge bladders and know how to use them! (Not scientifically verified–well, actually at the same level as this study wasâ€¦) My current dog likes to pee on snow. She will hunt out the one patch of snow in the yard and head for it. I doubt the magnetic field has anything to do with that. My question is “how much adult beverage was involved in the original idea for this study”? Or, as we used to say back in my Navy days when confronted by yet another improbable ‘scientific truth’: “Modern science knows no limitations!”. This one was from the time period â€œ20:01 â€“ 8:00â€³, i.e. ten at night to eight in the morning. Not that it makes any difference, but wouldn’t that be 8:00PM to 8:00AM? I have dachshund and shih tzu, both neutered males. Our observations over the last four days show a consistent pattern of stern into the wind or south westerly 35 degrees off magnetic north. I have no idea what this suggests but will leave it to the experts to evaluate the data. Great point! I think even dogs know better than to piss into the wind, no matter what direction they have to face. My adorable Havanese dog does an entertaining poop dance. She spins in artistic circles and does a few Havana walks, repeats and finally gets down to business. I donâ€™t know how she picks the spot or what the mentality behind this behavior is, but I know she doesn’t circle around just to find a parking space in a Chinatown. No, she doesn’t kick the grass afterwards. Love my dog! So this is where we’ve come to…an editorial load of crap about dogpoop…literally. But it’s a truly great theme that never goes out of style! This isn’t some isolated & obscure bit of academic ivory tower musing either. ‘Chicken Coop Ladder’ pops up by reference with some regularity in the mainstream with curious randomness. Author Michael Lewis, for example, references it in one of his books on the recent worldwide “housing bubble” citing its premise as consistent with how German banks were involved. This was such a profoundly tantalizing assessment that demand for that particular sub-analysis led to follow-on publication, such as: Itâ€™s the Economy, Dummkopf! by Michael Lewis, published Sep 2011 in Vanity Fair: http://www.vanityfair.com/business/features/2011/09/europe-201109). Find “Chicken Coop Ladder’ at: http://www.amazon.com/Life-Like-Chicken-Coop-Ladder/dp/0814320384 . Note the prices have held for years, so the demand, such as it is, is there! So, Briggs, there’s an opportunity for you: A follow-on statistical analysis to Dundes controversial work, perhaps setting the record straight, or something. Suddenly dogs are magnetic? Who comes up with this stuff? Here’s a study that should be right up your alley Dr. Briggs. I’d be very interested (genuinely so) in your reaction and analysis (if and when you have the time, of course). I don’t know if one can use http on your site so I’ll just paste the link. Rob–don’t know about conservatives in general, but as a matter of principle, I avoid businesses that label themselves “green”, “sustainable” etc. I consider that insulting–that they think I’m so stupid if they use these terms I’ll trot right in and empty my wallet. The study looks quite interesting. If this is really true, imagine the possibilities for doing celestial navigation after dark at the local dog park. I wonder, though, did the researchers factor in “invisible fencing” that sets up a local magnetic field in some yards? Yes, a mistake. I’ll fix. Update Had a glance. Dear Lord, what passes for “science” these days. Not sure it’s worth a whole post. They “discover” conservatives are conservatives and liberals liberals. Using regressions. And wee p-values. I expect many of the actions occur early in the day or late in the day. If that is the case, it is just likely the dogs don’t want the Sun in their eyes (from E or W) so point N or S.
The problem with that explanation Leonard, is that there really is no effect until the authors do the statistical voodoo that they do so well. The discussion section does mention a few alternatives such as the sun effect and the Clever Hans effect (always a perennial favorite) and makes for hilarious reading. This sentence I found especially amusing: “In the case of the dogs it thus would totally make sense to not pay attention to magnetic body alignment any more under conditions of a shifting magnetic field.” I had to check the research institutions to make sure that it didn’t come from California, like totally. On navigating with voiding dogs I note that facing north and facing south are treated as equivalent – aligning with the magnetic field. So not so useful after all. And if any confounded dog wants to signal the cardinal points in my garden he’ll get something linear to deal with and it won’t be a regression. Our 5 year old shih tzu has always had a routine of “mapping the universe” walking out of that pattern and getting her job done “outside of the mapping” we don’t really care, why. Just as long as she get’s ur done! !